My Weblog: Art Thursday... So Degas! There's a great story behind this Degas painting, which I detail in my book, "With Violets," (Avon, September 2008). The painting is called, "Manet Listening to His Wife Play the Piano." 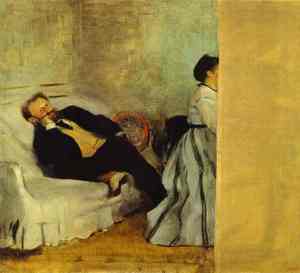 The story goes that when Degas gifted it to Manet, Manet was a less than gracious recipient. In fact, Manet is responsible for the ochre stripe down the right side of the canvas. What do you see in this painting? Except for a few classes I took in college I don't know much about art. When I look at this painting I see a middle-aged, slightly overweight guy looking fairly bored.